We’ve added a few neat new components to the Director’s Forum this year for the 2nd Annual event. 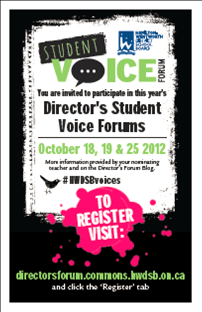 We thought that it would be really neat if students could receive an official invitation to attend the Student Voice Forums this year. Corporate Communications made us some really sweet looking invites that are currently being distributed to nominated students by the Student Success site leads of each @HWDSB secondary school. The students are as diverse as the schools of which they are apart. Like last year, the Forums are going to be dynamic, interactive experiences that honour student choice for expressing their voice. Not every student likes to talk in an open forum and not every student Tweets or likes to blog. Some like to talk opening face-to-face, and others like to talk more privately with a microphone or video conferencing setup. We are going to give them every opportunity to express themselves their way. These responses will enable us to be as responsive as we can and to create an experience as engaging as possible as we continue to “Know Our Students”, a priority in the HWDSB Annual Operating Plan.